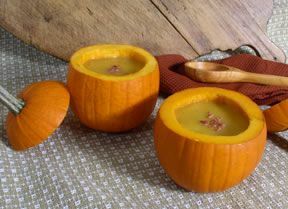 In a 6-quart saucepan, combine pumpkin puree, chicken broth, and pear nectar. Bring to a boil over high heat. Cover, reduce heat to low, and simmer 10 minutes. In a blender or the bowl of a food processor fitted with chopping blade, process 1 cup pumpkin mixture with peanut butter until smooth. Return to saucepan with the remaining pumpkin mixture. Add garlic, ginger root, green onion, lime juice, salt, and cayenne pepper, cook 10 minutes over medium heat. 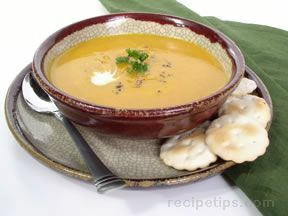 Divide soup among soup plates and garnish with pumpkin seeds and chives, if desired. Serve immediately.